Thu., Feb. 22, 2018, 8:21 a.m.
BOISE, Idaho – Some University of Idaho educators hope their new line of scarves will become an invasive trend, just like the noxious weeds they feature. The scarves are emblazoned with botanical prints based on plants like white oxeye daisy, purple spotted knapweed and yellow toadflax. The flowers are beautiful, but dangerous to the country’s landscapes because they can crowd out native plants and throw the ecosystem out of balance, says Melissa Hamilton, a UI extension office educator in Valley County, Idaho. Hamilton first got interested in fighting invasive weeds when she was with a student conservation association back in 2004, volunteering at an AmeriCorps service day project in upstate New York. The group spent the day pulling Japanese barberry weeds. Someone had planted the barberry as a landscaping barrier, and it quickly overtook the area. It can sometimes be hard to get property owners to care about invasive weeds, especially when they are beautiful, said Hamilton. In Valley County, where about 70 percent of property owners are only part-time residents, invasive species can spread quickly. Hamilton thought an aesthetically pleasing accessory might help spread the message, and serve as a tangible reminder even when property owners are away. 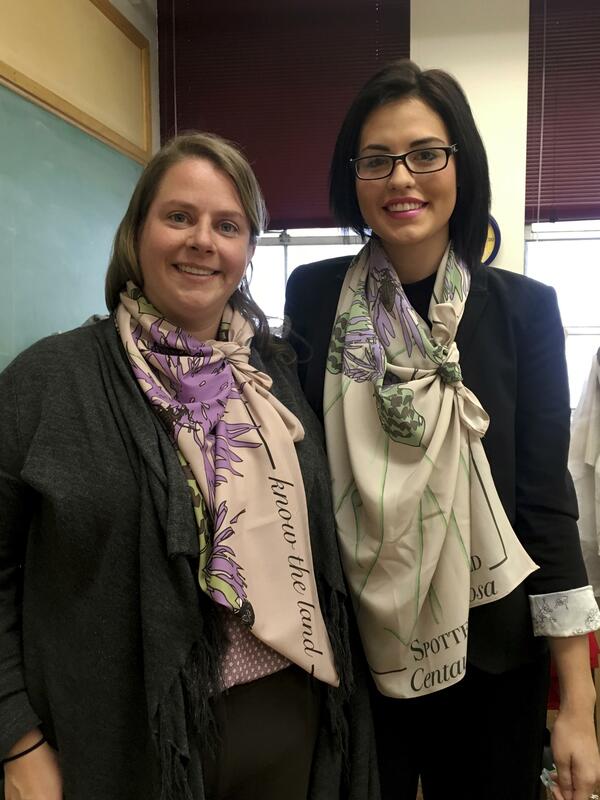 The designs were created by Wahl and a group of her senior textile and design students, and then Wahl and Hamilton spent much of 2016 obtaining licensing, finding a wholesale supplier and fine-tuning the fabric and quality. The school had a soft release of the scarves and bandanas late last year, making them available on the University of Idaho’s online marketplace . Each scarf and bandanna comes with information about the weed it features; they range in price from $12 to $32. Steve Anderson, Valley County’s weed superintendent, has a couple of the scarves framed in his office to show visitors what the weeds look like. “Most people I deal with had no idea they were growing noxious weeds on their property; someone dug it up and replanted it thinking it was just a pretty flower that eventually filled in their flower garden, crept across the yard and now has jumped the road and has taken over the pasture,” Anderson said in a prepared statement. UI spokeswoman Amy Calabretta says about 60 have sold so far, with very little promotion. The most popular so far? The spotted knapweed bandanna, Calabretta said. Hamilton expects the first small run of scarves and bandanas to sell out as the word spreads, generating enough money for another order – and hopefully, new designs. “It really is a national dilemma. Each invasive has its own story,” Hamilton said. Published: Feb. 22, 2018, 8:21 a.m.